Sometime in 2006 or 2007, I got a call about a feral cat colony in need of caretakers (regular followers of our Facebook page know that we are huge advocates of feral cat care, and we do a lot of work in the community to help these cats have a better quality of life). The colony was near Guilford College, and had recently been moved about 1/4 mile from the original location. Incredibly, someone had tried to kill the colony cats by poisoning their water bowls. We never found out who did that, but moved the colony any way. Moving a colony is no easy feat. There are houses and feeding stations to move, not to mention the cats themselves. Fortunately, the colony was small–only about 6 cats–and they readily followed us to the new location. I agreed to feed a couple days a week. It was a fun little volunteer gig. I adored the cats, which included a family of four sisters. The sisters were tabby cats–two grey and two black/brown. One cat of each color combo was pretty outgoing. They ran right up to me when I arrived with their food and water on my feeding days. This is not unusual, of course. Many ferals become comfortable around their caretakers, and will even allow us to pet them a little. I have many memories of caring for that colony. Year after year, we fed them. We put straw in their houses to keep warm in winter. We brought lots and lots of bowls, until one caretaker decided to tether the bowls with a cord (the bowls always went missing before that, either to the wind, or by enterprising raccoons that carried them off). One winter, I got my little KIA stuck in the mud, and had to wait a couple hours before being pulled out. I became friends with the other caretakers, and together we loved those cats just like we loved our domestic house cats. Over the years, the colony population changed. A new cat might show up, hang around for a month or so, then move on. At some point, the colony only contained the four tabby sisters. Like all managed colonies, our cats were spayed and neutered, so the only additional cats were the ones traveling between colonies or otherwise on the move (There are colonies everywhere, I mean everywhere. Cats easily travel through the sewer system and literally pop up all over the place). Then it began. We started seeing only three of the tabbys at feeding time. It’s heartbreaking, but it’s reality. The cats get old and pass away. Sometimes it’s worse–they get hit by a car. At some point in the last couple years, we only saw two tabbys at feeding time. And finally, just one. It was winter, maybe early spring. 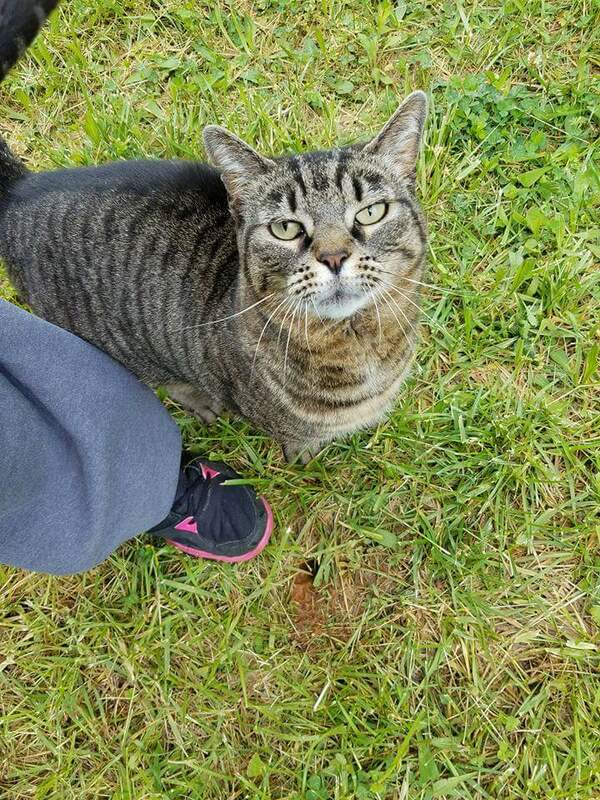 No matter what time we went, only one tabby met us at the feeding station. She was one of the more outgoing ones, a sweet black and brown senior girl. She always ran up, and walked right around our legs, nearly tripping us as we walked to her dish. She loved to be petted. It was always so good to see her. But it was hard to see her out there alone. Her sisters were gone, and she was a very social cat. She appeared to be a good candidate for adoption. 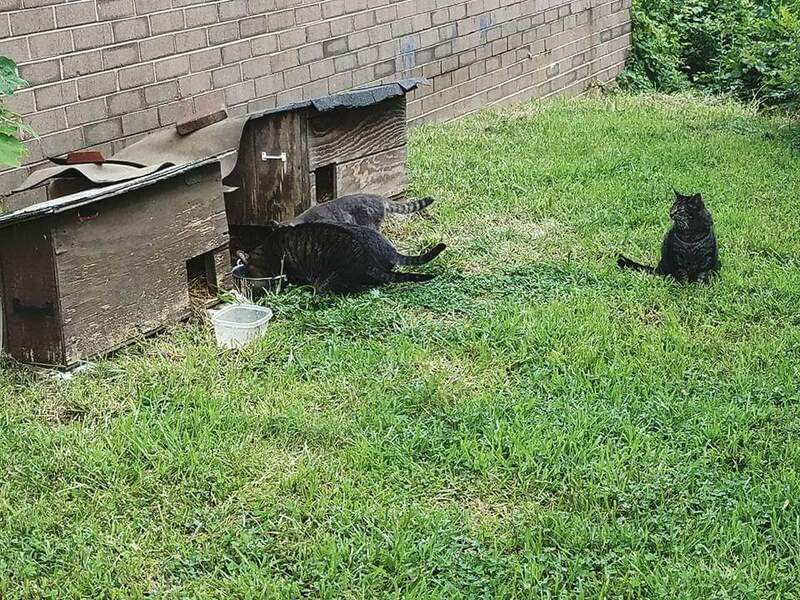 But bringing a feral cat home is a major operation–they have never been inside a house, and likely would be shy with anyone but the colony caretakers. We asked around, but for whatever reason, no one could take her. So we did. 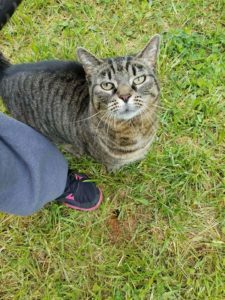 We owed it to her–she deserved to be with other cats and out of the elements. On a Sunday night about a month ago, we pulled up to the colony. This time, we came with a crate instead of dinner. Incredibly, she seemed to be ready to go. I scooped her up, put her in the crate, and then we headed to a 24-hour vet for a complete check up and vaccines. She got a clean bill of health, and we headed home. We had set up our back porch for her: new ceiling fan, new screen, even a neat shade that made the porch cooler for her. Most important, we had a brand new litter box set up, filled with ‘Cat Attract’ litter. Our smart little feral cat learned to use the litter box that first night! And so she’s home now. And inside, too. 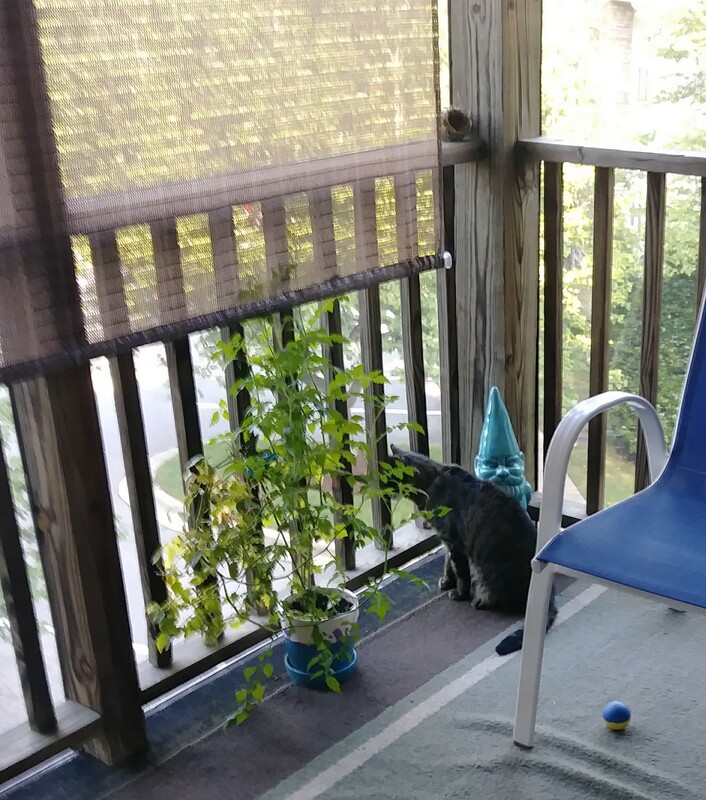 Turns out she was done with living outside, even if the new version had a fan, a view, and a sad little tomato plant that has yet to produce anything. She’s still getting used to our household. 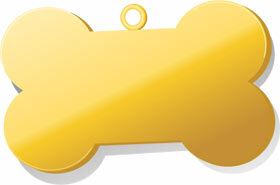 Dogs, cats, and all the daily sounds that a house contains–dishwasher, laundry, humans talking, the TV–it is all very new and overwhelming at times. But she’s doing really well, and will come around completely in her own time and on her own terms; after all, she’s a feral cat and that’s how they roll. A labor of love that started over a decade ago has culminated in a happy home for us and our longtime friend, who by the way, now has a name. It’s ‘Stripey’. Like reading your story about Stripey. Saved the story to share with others. Dan the tuesday feeder. Thanks Dan! Stripey is adjusting to indoor life. I think she misses her life outside, but she seems to understand this is safer, even if it’s not as adventurous as colony life!